It always seems like I end one year and start a new one reading books published by Blacksmith Books in Hong Kong. 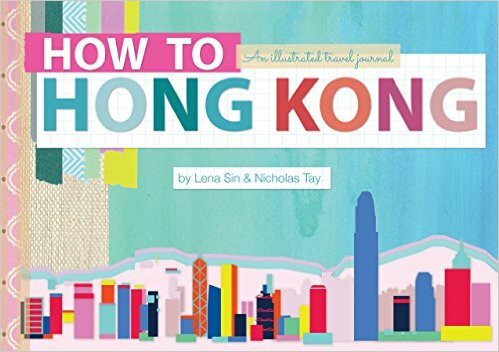 Today as I waited for my kids at Sunday School and stayed indoors as the snow blanketed Chicago, I sat down with Lena Sin and Nicholas Tay‘s How to Hong Kong: An Illustrated Travel Journal (Blacksmith Books, 2016). It’s available now through the publisher or for pre-ordering on Amazon. Blacksmith has published a number of illustrated books I love, especially from Lorette Roberts, so I was thrilled to see this new book by Sin and Tay. It’s part travel journal, part coffee table book, and surpassed my expectations, which were high. Sin was born in Hong Kong, but spent her formative years in Canada. She returned to Hong Kong when she was still in school (during the same time I lived there) and is now back in North America. But no matter where she lives, Hong Kong will alway be home. And her husband Nicholas wasn’t born in Hong Kong and didn’t live there as an adult, but after he started going there with Lena, it has quickly become home to him as well. This book an homage to that sense of home. Although I wasn’t born in Hong Kong and only lived there for five years, I could relate to so much of what she wrote. Equating the scent of moth balls and sewers with Hong Kong; appreciating the grunge of the old buildings; and basking in the magic of twilight in Sheung Wan. But back to the night in Stanley. I’ve had days and evenings like that, and many took place in Hong Kong. In fact, what I love about this book is that it brought me back to my most recent trip to Hong Kong. Although I’d traveled there this fall to revisit places from my twenties, I ended up structuring my days around seeing two dozen friends. And all of the places (except for a dreamy breakfast in Chungking Mansions, followed by a trip to a Tsim Sha Tsui tailor) I met friends were the very spots that Sin and Tay showcased in their book. I spent most of those six days in Sheung Wan, Central, Wan Chai, Causeway Bay, SoHo, other parts of the Mid-Levels, and even a quick tram ride to North Point. The book is adorned with photos, sketches, and paintings of half a dozen places on Hong Kong Island and Lantau Island. It wasn’t until I reached the end of the book that I realized it didn’t include any parts of Kowloon or the New Territories. Perhaps that’s where a sequel will come in. I wonder if they also like Chungking Mansions?